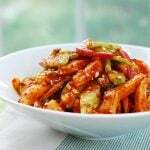 As I mentioned in my sigeumchi namul post, namul is the general term that refers to a seasoned vegetable side dish. 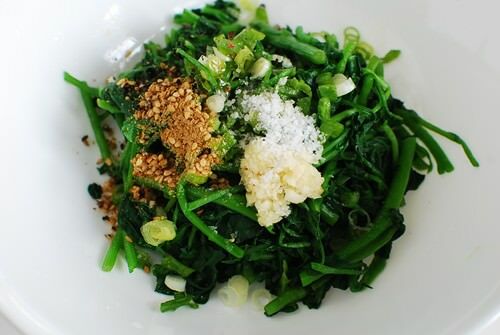 An infinite number of farm-grown or wild vegetables are used to make nauml dishes in Korea. One of my favorites, which can easily be found here in America, is watercress. I love its slightly bitter and peppery flavor. 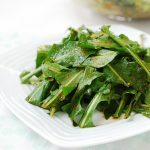 When lightly cooked, watercress has that crunchy and chewy texture Korean namul is known for. 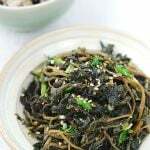 Depending on where you are, you may often find this dish among many side dishes served at Korean restaurants. 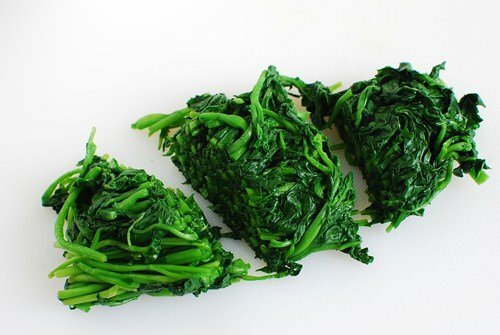 It is unbelievably easy to make and loaded with nutrients. 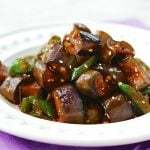 So, add this to your list of Korean side dishes! Like spinach, watercress cooks down significantly, so double the recipe if you’re serving more than 2 people or want to have some leftover for the next day. It is great in bibimbap as well. Boil about 10 cups of water with 2 teaspoons of salt. 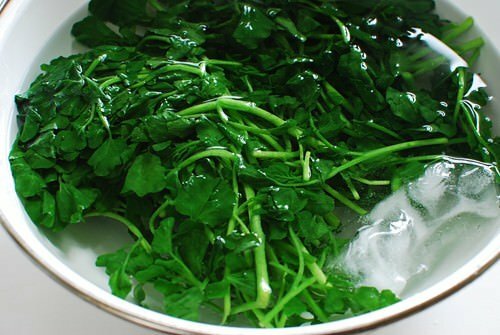 Blanch the watercress until wilted, 30 – 40 seconds. Quickly remove it from the pot and shock in cold water to stop the cooking. Drain and gently squeeze out excess water. Cut into 2 to 3-inch lengths. Add the remaining ingredients and mix everything well, by hand. Let it sit for at least 10 minutes for the seasonings to seep into the watercress. This sounds so good and makes me hungry for fresh! No watercress for miles…so, one of these days! I have been making my version of Bean Sprout Namul for many years and I can’t wait to try this authentic recipe, Hyosun! 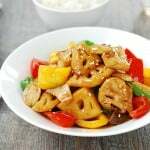 How come I`ve never thought of this simple technique in cooking vegetables! Thank you for sharing this, Hyosun! I love how simple the recipe sounds…! 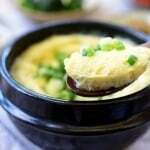 I’ve always enjoyed eating Korean food with its side dishes, this recipe is definitely on my list-to-try :). Thanks for sharing :). I love this idea! I don’t know much about Korean food but I know I like watercress so I’m sure I will enjoy this one. Thank you so much, everyone! 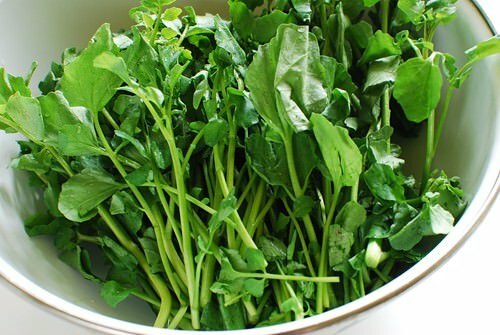 Watercress is such a wonderful vegetable. Hope you get to try this dish. I enjoy many of the Korean seasoned vegetables. Soy bean sprouts and spinach are among my favorites. I know I will like this watercress namul as I love watercress. This sounds really good! I have been buying watercress for years, I love it, but I have only used it in salads (raw). Thank you for this wonderful idea! I will try it next time! By the way, I have made your pork rolls with shiso (oops, I suppose you don’t say shiso in Korean…) this weekend and they were fantastic! They don’t look as beautiful as yours of course, but the taste was great. I’m so happy your blog encouraged me to cook more Korean! Now I have also to learn by heart the different names of certain products, also used in Japan (like tempura). Thanks for your kind comment on my blog. I absolutely love your blog, and I’m following you! Your authentic Korean dishes are amazing, and it’s so nice that you have the wonderful step-by-step tutorial for someone like myself, that does not know, or even have Korean recipes, other than the “kimchi”…which I also love. Spicy food are an all-time favorites of mine! Biren – Thanks! I love soy bean sprouts and spinach namul too! 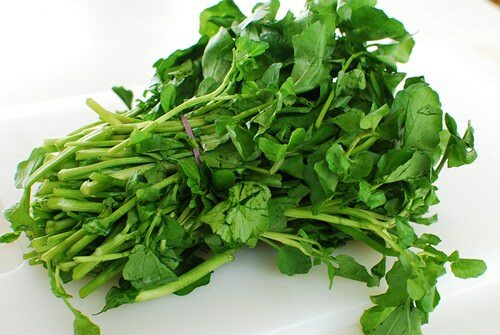 This watercress namul looks very similar to spinach but obviously tastes very different. You will like it. Christy – Thanks for visiting! Yes, it is really easy to make. Enjoy! Sissi – Thanks! I saw the pork rolls on your blog. They looked great! Nice job! Elisabeth – Thanks for stopping by. I hope you get to try some Korean dishes. You have a nice blog, and I enjoy visiting. Charles – Thank you for visiting! I am so glad you’ve found my blog. 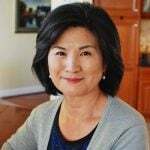 Hope to hear from you more on your Korean cooking! 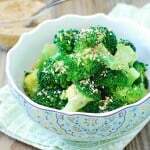 I think what you did here is awesome..using sesame seeds and sesame oil plus garlic I would assume it killed the bitter taste of the watercress..just beautiful healthy side dish..Thanks for sharing, and have a wonderful weekend!!!! Thank you, Sandra! Now that you mentioned, I should’ve said that. Blanching and seasoning does reduce the bitterness. This looks so tasty! 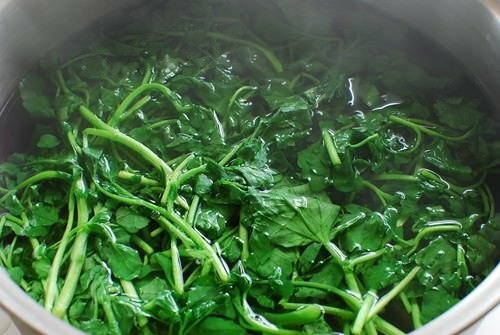 The only way I know how to cook watercress is in soup. I’m sure the combo between watercress and sesame is amazing, cutting on the watercress strong taste. Sissi and Raxana – Thank you! I just have a quick question to ask. How long can the namul dishes last? In other words, can i store any leftovers in the fridge over the next 2 or 3 days because i plan to make loads of them in one go. No problem for 2 to 3 days. Most of them should last up to 4 to 5 days. Enjoy! Is this originally made with minari (미나리)? I love 미나리 but can’t find recipes for it other than in kimchi. What else can I do with it? Your recipes are so well written – I really enjoy using them. I have been cooking only Korean food for several years, make a lot of kimchi (even have a kimchi fridge!) and am lucky to live in Silicon Valley just a mile from two Korean markets. Thanks for this great blog. Hi Judith – Thanks for the nice words! Yes you’re lucky. I haven’t been able to find minari lately in the DC area. 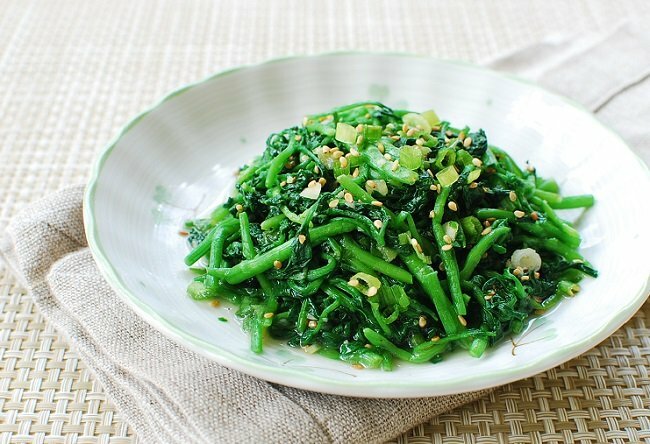 You can definitely make a side dish with minari using this recipe, or use it in salad. Minari is also used in stews in Korea. Also see my ojingeo muchim, doenjang marinated pork, and agujjim for the recipes that used minari. Awesome. Simple so good! Thank you for sharing. i would like to ask if there is any video to show how to make it ?? Sorry I don’t do videos. This is a simple recipe so hope you can just follow the recipe to make it, but you can alway try to search the internet for a video version. 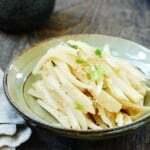 Hi,this recipe is very nice namul, simple and easy to make but i have one question, on the last photo,when we mix the remaining ingredients, what is the name of ingredient that looks yellowish? Is it roasted sesame seeds? Thx for sharing. I really love how in your newer recipes you write the name of some ingredients in Korean too. Since I live in Korea it is so great to know the exact name of the ingredient when I go shopping. I looked up in the dictionary what watercress is in Korean! I can see both 물냉이 and 미나리.